bFLAT, Indiranagar, Bangalore city's first dedicated performance venue/club for live music and entertainment, turns 10! We are so proud to be firmly established on India's music map and celebrate this milestone with an amazing weekend of entertainment. 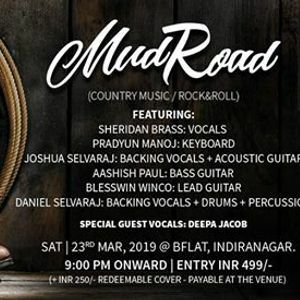 This Saturday we present Mud Road! The Country music and Rock & Roll band that keeps you singing and dancing all night! The audience can experience a 'feel good' evening, filled with rich melodies and harmonies and plenty of nostalgia! The rich baritone of Sheridan Brass is reminiscent of old country music legends and adds to the charm on stage. The band’s versatile repertoire is groovy, eclectic and fun, as they take you for a ride down memory lane with yesterday’s classics and with a few twists to some current favourites. 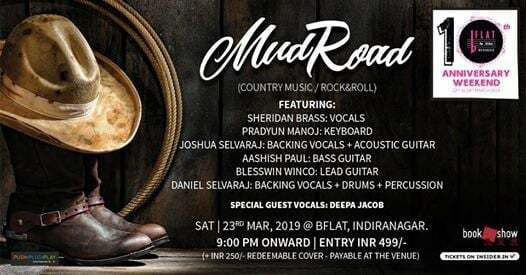 Mud Road will cover tunes by popular artistes like Don Williams, The Eagles, Blake Shelton, Zac Brown band, Amos Lee, Chris Stapleton, Dierks Bentley and more. Mud Road - Country music for your soul, Rock & Roll for your feet! No Reservations - Seating on a first come basis. Mud Road is like a group of best friends who share the same taste and musical roots. This is reflected in the joy with which they perform. High on entertainment, it’s hard to stay in your seats! Their musical influences range from Country music to Gospel and Blues to Rock ’n Roll - a very compelling live music performance.